Make Creamy Layered JELL-O Squares with your favorite gelatin flavor! 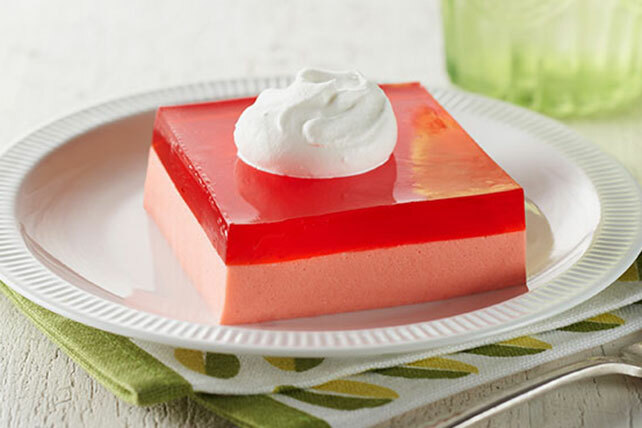 Whisk in COOL WHIP to give the Healthy Living layered JELL-O dessert a creamy bottom. Add boiling water to gelatin mix in large bowl; stir 2 min. until completely dissolved. Add enough ice to cold water to measure 1-1/2 cups. Add to gelatin; stir until ice is completely melted. Remove 1-1/2 cups gelatin; set aside on counter. Refrigerate remaining gelatin 30 min. or until slightly thickened. Add 3/4 cup COOL WHIP to chilled thickened gelatin; whisk until well blended. Pour into 8-inch square dish. Refrigerate 15 min. or until gelatin mixture is set but not firm. Carefully pour reserved gelatin over creamy gelatin layer in dish. Refrigerate 3 hours or until firm. Cut into squares; top with remaining COOL WHIP. Prepare using any flavor JELL-O Sugar Free Gelatin. Desserts made with, or decorated with, COOL WHIP should be stored in the refrigerator. Prepare using 2 pkg. (0.3 oz. each) JELL-O Strawberry Flavor Sugar Free Gelatin.